The inspections of the Pomona Granges and the evaluations of the Community Granges should be just about completed as you read this. I am anticipating some good reports this year as many Granges have taken in new members last year and they should be aiding their Granges. I have visited Granges where new members are already making an impact. Many Granges used the month of April, Grange Month, to have special programs and present themselves to their communities. Many others are planning programs for this month that are open to the public. I am expecting some good reports from them on their success. 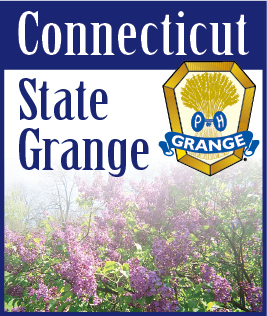 Every little bit of effort expended to bring in members is greatly appreciated and I hope later this month, to give you good news on the efforts of the State Grange. The National Grange website contains a wealth of information for ideas to use in planning a public forum for your Grange to present in your community. Use the link to the leadership/membership site. There are Granges that have used their own ideas with good success. If you really want to do something it’s not that difficult. Contact our own membership committee. Membership is one area that has to be worked on continually in order to impact our organization. A report on the camp clean-up and the Pink Sash meeting will also be given later. Camp brochures were given out at that meeting and should be being distributed among the Granges now. There will be an open house at the camp on May 17 with tours available. Pack a lunch and come up that day and see how great the camp really is. There are high hopes for an improved camping season this year and with every ones help it can be done. So now that spring is really here and the weather is more agreeable let us all put an effort into growing our Grange. Just as you are planting the seeds for your gardens and flower beds, why not plant some seeds for members. The seeds are your activities and efforts that spread the word about us. We are all proud of our Order so tell others about it and us and may the seeds you plant this spring blossom into many new members in the fall.